The ROLINX CapLink Solutions by Rogers Corporation 's Power Electronicsc Solutions (PES) will be presented at PCIM Europe (Power Conversion and Intelligent Motion), the international leading exhibition for Power Electronics, Intelligent Motion, Renewable Energy and Energy Management, taking place at the Nuremberg Messe in Nuremberg, Germany from June 05 – 07, 2018. Rogers PES will be exhibiting in Hall 9 at Booth 406. Rogers PES will also participate, with co-authors Sebastian Polster and Olivier Mathieu, as part of the poster session with University of Applied Sciences Landshut, Germany on, “Low Inductive SiC Power Module Design Using Ceramic Multilayer Substrates”. This paper will report on a novel 600 V / 200 A full silicon carbide (SiC) water-cooled half-bridge inverter module with ultra-low stray inductance, improved EMI performance and extreme compact design. (Tuesday, June 5th, 3:15-5:30 PM, Foyer Entrance Mitte). Visitors to Rogers´ booth will also have the chance to discover the wide range of ROLINX customized busbar solutions and assemblies renowned for their reliability, safety, and durability in the most demanding applications including mass transit and electric propulsion, industrial drives, renewable energy, and automotive systems. 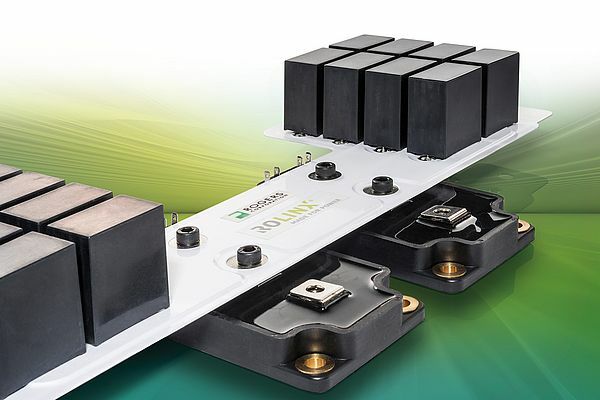 ROLINX busbar solutions offer low inductance, compact and highly customizable designs and in combination with capacitors, extremely low inductance and high power density capabilities.